How To Write For Listverse and Get Paid $100 per Article? Have you wonder what is Listverse about? I’ve come across this platform since 2010 where writers claimed to earn $100 per article published. If this is true, will this be a good platform for new writers to practice writing, like what Textbroker offers. Or is it only for experienced writers who are already writing to earn money online? One more question that I really like to find out is …. can anyone really earn money online writing for Listverse? To quench my thirst for the truth, I did some research on Listverse. Here is what most people agree about Listverse. Listverse is a huge compilation of cool, interesting and bizarre lists of things happening in this world. The quality of content is actually very good and it’s fun just browsing around reading the lists. Ranging from scientific, to entertainment, to topics about lifestyle, Listverse is anything but “ordinary”. You can definitely find unexpected content from this website. From my initial research, I found out that many writers were happy with Listverse for approving content and paid writers within days. These are mostly reviews or comments more than five years ago. But is it still the same now? Let's find out how writers can earn money from Listverse now. Why I Won't Consider Listverse? Summary: Listverse is not a scam but neither will it be worth your time, especially if you are new to writing. There is odd chances that your article will be approved. Only a handful of articles will be approved monthly. Recommended: Only for experienced writers who do not mind spending tons of research hours or days to produce one unique article that has odd chances to get published. Definitely NOT for New Writers! If you are a new writer, then I highly recommend you to get my free guide to start a small business online, WRITING! Listverse is a user-generated online content publisher that only showcases unique, extraordinary and bizarre articles submitted by writers from all around the world. Writers will get paid once an article pass the scrutiny of the site’s editors. Unlike other freelance writing websites where you need to register to submit, in Listverse, this is not required. You just need to write according to its guidelines, submit, get approved, and get paid. As long as you can write English, you are eligible to earn from Listverse. Many people go to the website to read about unusual things that happen around the world. But there are some, mostly writers who go to the website to research nature of its content and read article submission guidelines with the hope that this can increase the chances of their article being approved. Listverse, ranked 9,109 on Alexa ranking and claims to attract more than eight million readers every month. With the aim to intrigue and educate their readers with a variety of rich content, the website focuses on six main topics in science, entertainment, lifestyle, society, general knowledge, and bizarre. Listverse publishes at least three approved articles every day, selected from hundreds of submissions they received from writers who are looking for ways to earn money online. With so many submissions but only 3 approvals, this means that it's difficult to get your article approved. Writers are required to follow their strict guidelines before any article can even be considered. The good news is you don't have to submit pictures or video as its editors will take care of this. In the past, all articles submitted to Listverse will be read and reviewed by the company’s editors with feedback provided despite rejected, but it is no longer the case now as stated in their Listverse Author Guide shown below. Here's how writers make money with Listverse – create a list of 10 items inside your article, submit and wait for result. Once your article is approved, you get paid $100 via Paypal within 30 days. Even though the process to make money with Listverse is simple, this doesn’t mean it is easy for your article to be accepted by them. The company has strict rules and guidelines when it comes to the kind of article they would accept. First rule is to make sure that the 10 items in your article must not have been published elsewhere. This also means, there will be tons of research you need to do in order to earn $100. Not only do you need to check existing content on Listverse to avoid duplicates, you too need to make sure that the content you wanted to write has not yet been available on other sites as well. I’ve tried to search their site for existing list. It’s not straightforward and their search feature doesn’t seem to product the results accurately. How can a writer knows what is the right topic to begin with if there’s no way you can do a research on Listverse's website? From its homepage, I can only conclude that Listverse loves topic about hidden knowledge, unsolved mysteries and misconceptions. In short, all they need is unique yet mysterious or bizarre content. The last that this website will ever approve is common or ordinary topic. Never start with topics that fall into the category of self-help, sports, adult, personal stories, gaming or illegal content as all these will not accepted . Despite personal opinion is not acceptable, but if you think your opinion can fit in perfectly on Listverse, you must back up with facts from reputable sources or face outright rejection. Wikipedia as a source is not accepted! 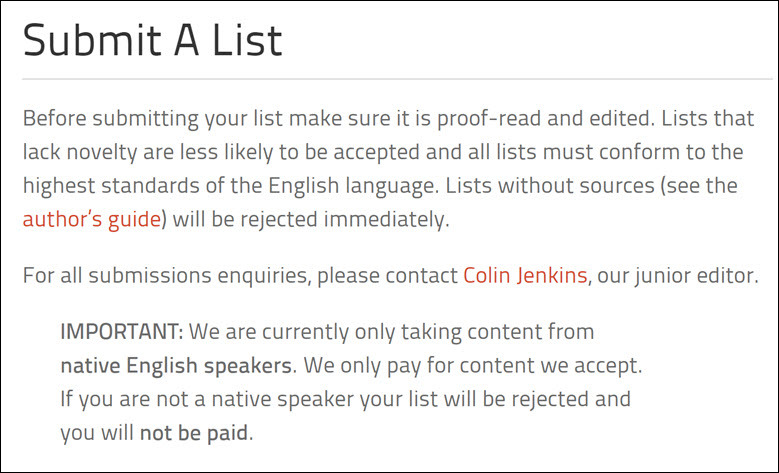 Currently, Listverse only accept articles from native English speakers and those who are not will be rejected. This shows Listverse have very high standard of the English language. On top of the strict guidelines, there is also strong competition to get your article published. As I mentioned earlier, Listverse only approves 3 articles daily, selected from hundreds of submissions. It is very rare that they will publish more. This means competition to get approval is very tough. It is suggested that the article submitted should be about 1,800 words. Unlike last time where articles get approved within days, now be prepared to wait for 2 to 4 weeks before they respond. According to its founder Jamie Frater, Listverse is taking longer time to respond because the company wants to give writers more of a chance to be accepted. 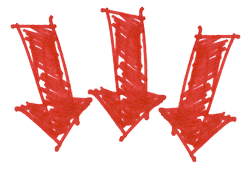 Recently there are cases reported by writers that Listverse either delayed in payment or failed to pay for articles published on their website. No explanation is given by the company on this allegation. Despite it is tough to get your article approved, there are things Listverse has made attractive for people to submit their work. No signup is required to submit an article. Simple and easy to follow submission process. Earn $100 for every 1,800 words approved. Seriously, if you ask me, I will tell you that Listverse is not something that I will choose to make extra income. Here are the reasons why. Tough competition. More than 150 submissions but only 3 articles approved daily. Low chances for approval. Despite many negative comments about Listverse lurking on the internet (mostly because of list got rejected and late payment), Listverse is NOT a Scam. There are people who regularly receive payment from this platform too. But I won't recommend this platform to anyone, especially non-native English writers or new writers. Many writers spend at least 15 to 50 hours to create a single piece of content. The amount of time spent on an article to earn $100 is not worth it. Yes, Listverse is a platform that pays writers, but the compensation is unpredictable. The odds of your article getting approved is just too low. Out of 150 or more submissions, only 3 will be accepted. Listverse is asking way too much from writers. As a writer, I can imagine it will be extremely frustrating to put in all your energy into an article only for it to be rejected, not due to quality of writing but because of the unfavorable odds of getting selected. I don’t think Listverse is something I would try to earn money from writing, and I urge you not to either. I've seen many people who are good writers managed to make 5 to 6 figure income by following this proven strategy to start a small business online. And I was lucky to learn this form a mentor that I met 3 years ago. I've put everything that I know into this free guide below so you can follow the exact steps that I took to start my small business online. I am sure by now you have already know what is Listverse about. If you find this article useful, please help to share via Facebook or Twitter so your fellow writer's community can also know the downside of writing for this website. 57 Comments on "What is Listverse About? (Is It Worth Your Time?)" Thanks for sharing your review of Listverse and what it’s about. I’m glad to know that it’s not a scam, but you clearly explained that it can be difficult for one’s work/article to be approved. $100 per article does sound nice, but it does seem like it’ll be a little hard to come by. It’s nice to know that no signup is required, but spending tons of time on research to make sure your article is fully original and has not be talked about already can be tough. Even though it’s not a scam, I’ll still look around for other writing platforms. Have you used Listverse a lot? Nope. I’ve never try Listverse but my friend did. He tried a few times but just so tough to get his article accepted. That’s why I decided to find out about Listverse and wrote this review. I think starting a blog and promote affiliate products. At least you just write once but can earn many times. I would have walk away after hearing how much work you really have to do. Researching their content is just one bit of time I would need for myself. Only 3 accepted per day? I am definitely walking away because 1800 words of great content can’t be written quickly. I could probably only make $100/month writing for Listverse. This was a very interesting article. I have been searching through different sites for my daughter so that she can make some extra income writing articles and content. I’ll let her know about your review on Listverse. Very informative!!! You have provided a lot of detail and you have a great site. Great review. Thank you. Great to give her such exposure too. If she’s a new writer, I suggest that she write for Textbroker. Is easier to be accepted as writer in this platform. A good place for her to learn too. Of if she wants to start a blog and earn money selling affiliate products, then maybe can try Wealthy Affiliate. Listverse sounds like it would be okay for very experienced writers or if you had an unusual topic that they would like and approve for publication. Still, $100 one time is not that great when you can spend the time writing for your own blog and having affiliate links where you could earn a lot more over time. Thank you for a clear and thorough review of Listverse to keep me from wasting my time getting involved in something that wouldn’t work out to very good pay. I used to write for others but when I think about it, is not really worth my time. So I build my blog and start writing for myself. Better this way. I highly recommend anyone who want to start blogging to try Wealthy Affiliate. This is how I started this blog too. Truly amazing community. Listverse is an interesting beast. I am a regular user of the platform and I admit I do find it very interesting. I think you are right about Listverse, it is not a scam, but to make money out of it seems to be tough. From what I can tell as a reader is that Listverse tends towards a type of writer. The articles, while different topics all seem to sound very similar. This maybe due to some of the editing the Listverse do to article before they post, but I think that is unlikely. It is kind of like TED talks, they are all different topics, present by different people but they all seem to follow a template and have a similar ‘tone’ to them. Perhaps if writers study what Listverse is currently posting then they might be able to pick up on the trends and get possibly make more money out of it. However, this would mean even more research time like you mentioned. Man Listverse has some steep competition for just $100. Spending 15-50 hours on a post and can’t guarantee a spot in those of three posts posted. I can say not worth the time to post there. plus if your English isn’t spot on you are definitely disqualified. I see it as legit to but only for the experienced writers. Me personally I would rather post on my blog, promote affiliate product and earn money. Anyway Listverse content is really cool. Good for reading purposes. I too prefer to blog and earn money promoting affiliate products. You should try to promote a program called Wealthy Affiliate. It pays reasonable commission and always on time. Listverse doesn’t seem like a great idea for new writers, since it is so unlikely that you will get accepted for your writing. The odds do not seem to be in your favour.The payout could be better for all those hours of work put into writing and reseaching. It would not seem like something that I would want to put a lot of effort into because of the low approval rate. Regardless it is Listverse or the simpler Textbroker, writing for others is not me too. I prefer to start a blog, then write once and get paid many times. Hi! Earning through writing online may sound like kind of a dream. But I also know it can be possible. I have been exploring a handful of opportunities and come across the recommendation of Listverse. Thanks for explaining that articles submitted to this platform rarely get approved. That as beginners, there may be better ways of earning money writing. You are absolutely right Henry. There are just so many opportunities out there especially for young beginners. I won’t recommend anyone to write for Listverse if wanting to earn a stable income. Hello Florence Ki thank you for sharing your review on Listverse. From you deep and comprehensive review right on this page, I can see that Listverse is definitely not a place for new writers and I think definitely not a place for most advanced writers too. It will be a thorn in the flesh to write an awesome content/article and not get approval after submission. The competition is so high and only the fittest will survive. I found your article because I write a lot of content for the internet and am always keen to diversify into something new and something innovative. What what I read about listverse it certainly is innovative but more to the benefit of the website owners. If you owned the site it could turn into a gold mine, for the rest of us I fear you are right in your assessment. I can think of a handful of more efficient ways to make money online. One question: If you get rejected, do you get to keep the content and publish it elsewhere? Of course. The content belong to you and you are free to do whatever you like as long as it is not accepted and paid by Listverse. $100 for one written article. Wow that really sounds too good to be true. Initially that title is what drew me to read the post. What i’m wondering though. Is that if readers get to read the posts for free, then where does the money come from for such a huge payment. I don’t think i would take on the challenge of writing for Listverse. As stated only 3 articles are approved daily out of potentially hundreds submitted. That’s crazy levels of competition right there. Checked out your Top recommended program too. That looks way better option than Listverse. Compared with the money Listverse earn from advertisers, $100 is too little for content owner. Wealthy Affiliate is definitely a better choice. I won’t write for Listverse at this point of time too. But don’t mind to give it a try when I have more free time. Like you, I am focusing to build my online business. At the stage of writing my second ebook. Luckily I’ve found a very powerful ebook creator software that makes creating ebook super easy. Otherwise I would end up spending weeks doing it like how I did last time. If you too are creating ebook, I highly recommend you to use the tool that I am using. Thank you for sharing all about Listverse, am happy to know that its not for new writers like me, because I would have been so angry submitting an article I must have spent hours researching and putting together only for it not to be approved. This article of your have saved a lot of precious time for new writers who might have been thinking of submitting some of their time spent article for an expectation, only for the hopes to dashed because of high competition. You did well for this review, as I appreciate it, I know many more do out there. Thanks, I now know more. I often use Listverse as it has really unique and ‘outside the box’ article topics – I usually check out the UFO and conspiracy articles on there. I was aware that they pay really well for each article published, but each article needs to be in a extended list format and they don’t accept anything scrappy – your English grammar and overall English writing intelligence needs to be at a top level. How many articles have you managed to get published with them? None. I didn’t even bother to write anything for Listverse after knowing the intense competition and unfavourable odds for my article to be published. As I am not an English native writer, don’t think my article will ever get published. When I first heard that Listverse pays $100 per article, I was definitely intrigued and thought it would be a good way to earn some side income. But this sounds way too tough. Only 3 articles per day out of hundreds of submission is ridiculous. One would probably need to spend tens of hours and submit a few articles just to get one approved to earn a hundred bucks. I’m sure there are many other opportunities elsewhere! That’s right. It’s just not worth to submit articles to Listverse when you can start a small business by writing – and earn much more. One way is to start niche marketing with Wealthy Affiliate. Initially I was also interested to write for Listverse. That’s why I did a thorough research about Listverse. But with this level of high competition and the lack of opportunity for article to get published, I guess anyone will choose other alternatives to make money online. Now I started my own online business and the return is 100x more than writing for Listverse. Don’t think I will recommend anyone to write for Listverse at this moment. Always looking forward to your educative and realistic posts. I have heard of listverse but was put off by their stringent rules and the fact that your article which you write with utmost efforts and resources could find it’s way into the dustbin, what a wasted effort. Websites like Fivver and the rest have shown that a lot of money can be made from writing as a professIonal . I ‘ve tried my hands on writing but I love your detailed idea of earning passively and I think I will give transcription a trial. Let me know after you try transcription. I am now currently focus on writing on my own business blog and might try transcription once I’ve achieved my goals. Listverse sounds like a really useful platform for anyone who is good at writing articles. I really like everything about Listverse especially that it is free for anyone and you can earn almost $100 per article which is what everyone works for everyday in ther 9 -5 job. Yes Listverse is really good for people who can write well. But you need to also be a fast and excellent researcher in order to compete for attention. Otherwise it would be tough to get your article published especially when there’re only 3 articles that will be published out of hundreds of articles received. If you decide to try out Listverse, 8 hope you can add on your experience here. So it seems like no matter how well I can write or speak in English, they won’t accept my content just because I don’t come from an English speaking country? That’s so unfair and discriminating. But t can still do very good research online. Collecting bizarre stories from around the world is not a problem to me at all. Anyway, $100 for an unique article is not really worth my time to do it. I thank you for this very great article. I have a very unique writing style but I don’t think I want to waste all my time doing research on information that may have already been released. Listverse is only good if you have extra free time. I heard there are people who make money from blogging. And some even make up to 6 and 7 digits income a year. Do you have any idea how I can start blogging too? I think what you meant is creating a niche business. That’s what I do too. When people says that they make money from blogging, what they did is identify a profitable niche market, create a website and content surrounding that niche, find relevant affiliate products to promote and start making affiliate commission. Once your website has build its own authority and brand around that niche, Google will rank your pages higher. That’s how people managed to find your website and buy your products. If you want to know more about this, I suggest that you get a copy of My FREE Guide to start a small business online. In this guide, you can copy the exact method that I used to start my business to make money online. 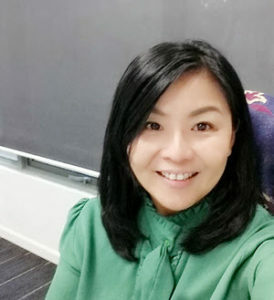 I have done different types of writing, from writing a book for third graders (making more than $2K), to answering questions on the internet for a few cents each, and other things in between. But, as much as I love writing, I would not want to put my time, effort, and heart into something that is very likely to be rejected. Thanks for pointing out this downside about Listverse. It seems like they started off pretty good, but could not accommodate such a huge influx of writing. However, the internet as a whole has great potential for those who love to write. I definitely agree with you that it would be far more worthwhile for writers to start their own online businesses. Yes, that’s what I did too. Now, I finally can earn money by writing more content inside my blog. The income earned is much more than writing for Listverse. Thanks to Wealthy Affiliate that I managed to increase my income not only through writing but also from offering online marketing services to local companies. Here’s how I make money with Wealthy Affiliate. Thanks for making a review of Listverse. Never heard of Listverse before but the articles inside this website are indeed very interesting. No wonder they are willing to pay $100 to writers who managed to get their article published. But it’s too taxing when you need to spend so much time researching. Based on my experience, the research itself can take up one whole day if you really want to create an article that has higher chance to get approved. I won’t want to try this because if I’ve one full day to work on any money making opportunities, I rather start promoting Amazon products via Facebook or maybe start a blog? Starting a blog should be interesting. I saw many successful marketers have their own blog. How did you start this blog? Any program you are attached with? Yes, ultimately having a blog is important for every business. I started my business blog with a program called Wealthy Affiliate. This affiliate marketing program is owned by two Canadian named Kyle and Carson and has been established for 14 years. Inside the program, you can learn about how to start a niche website, create post, insert affiliate links, drive free and paid traffic, and finally make affiliate commission. Despite this program focuses to teach free traffic strategies, I would say the paid traffic training is equally good. If you are interested, you can register for a free Starter membership to give this program a try. After you register, you can start to build 2 free websites, get 10 free training lessons and get 7 days free access to learn from super affiliates. I can recommend few super affiliates for you to learn from after you got into the program. See you inside. I have to say, based on the time spend on research, the strict guidelines and fierce competition, I’m not sure I’d invest time to create an article and wait for Listverse to accept. For me $100 is only about 2-3 hours of my time. But looking at the type of article published on Listverse, I think it can take up to 5 hours just to do a research. That’s taking too much of my time. I don’t think is worth it. I am always trying to find the best way to make money online. But until now, I can’t find any that’s good. Is there any program you can recommend for me to start with? Hi Scott, thanks for reading my Listverse review. I believe you must be a writer since you are searching for ways to earn money from Listverse. Being a writer, we have many choices. For instance, you can start a small blogging business and start making affiliate commission from the comfort of your home. That’s what I did which enable me to quit my C-level job that’s full of stress and toxic office politics. If this sounds interesting to you, I suggest you register for a free starter membership account with the program that helped me start my small online business. You can then try out the program yourself to see whether it’s suitable. Once you are inside, I’ll connect with you and help you with setting up your first business blog. Listverse Seemed rather interesting and then a shame to see it’s very much like pot luck if your article will be approved. With only three articles being approved and published it seems as though it’s very much pot luck regardless if you submit a fantastic piece. Thanks for sharing this review! You are right Dianne. That’s why I won’t consider writing for Listverse. For me, I prefer to write in my own blog, which also form part of my online business. If you too are interested to start making money through blogging, you might want to download my Free Guide. In this guide, you will learn the exact strategy I use to make money online through blogging. I have to agree with you on Listverse. If I am going to take the time to write an article that is well researched, SEO ready and, engaging–I’m going to put that on my own web pages! I have yet to find any company like this that is worth my time. The only success I’ve had writing for others is through direct referrals or, relationships that I sought out. While Listverse seems like a fun site I thought I might try an article submission some time for fun but, as soon as I landed on the homepage I noticed something. They don’t even have an SSL certificate! I know for me that is a huge no no. Why would I write for a site that can’t even spend a second to get up to date? Florence, good work discussing this one. Again, I agree…write for yourself! Nowadays, having SSL protected site is really important. However, many sites are still not doing anything much to protect their readers. Btw, do you have your own website already? If you haven’t I strongly suggest you to host your website with SiteRubix. It’s free if you are just looking at using their platform without the need for a customized domain. I heard about Listverse, and the the reason I didn’t try is the same exact reasons you mentioned in your post. It’s really an odd game for any article to get approved. As I am a writer, currently I write for Fiverr. But the money earned is too little and can’t be a long term solution to make money online. Do you know any proven way to start a small business online so I can make money stay at home? I mean those that can be long-term. You have definitely ask the right person! I started my small online business with a program called Wealthy Affiliate. It’s hard work but definitely worth every effort and time spent. Here’s how Wealthy Affiliate works. This program has helped me quit my C-level job and start working from home. I suggest you get a free membership account and try it out yourself. Once you’re inside member’s platform, I will connect for you. Of course, listverse is a very good opportunity for writer to earn some money online from the comfort of their homes but it pays more for experienced writers. You’d find better opportunities from freelancing website such as fiverr and upwork where you get to earn as much as possible within a very short period. True, Fiverr & Upwork are definitely better choice than Listverse. But if anyone want to have immediate income from writing, I suggest to try Textbroker too. At least it has more writing jobs compared to the other 2 platforms. However, if anyone wanted to have long-term and sustainable income from writing, it’ll be best to start a blog and write to get ranked on Google at the same time promote affiliate products. Here’s how many people make money from writing a blog. $100 bucks sounds great to make for writing one article until I read what you have to go through to get there. OMG, what you laid out sounds pretty strict. Not to mention the time and effort that needs to be put in place in hopes that you make $100 dollars. If people really like to write, people are much better off just starting their own website and writing content on there. You are right Evie. As long term measure, it’ll be better to start a blog as a business rather than writing for others. However, if anyone wanting immediate income, then I suggest it’s better to write for Textbroker than Listverse. At least, it’s easier for your writing to be accepted and make money. Listverse sounds like a legit platform for writers to make money, considering that you get paid $100 for every article published. I do enjoy writing and doing some research. But if Listverse wants bizarre or rather unusual stories, I have quite a lot and I can say that you won’t find them anywhere else on the internet because they’re my stories to tell. If I understand it right, Listverse wants articles that are sure to pique the curiosity of readers. While I like that they did not make the sign up and submission of articles complicated and that there’s no limit to the number you can submit, you mentioned that it’s really not that easy for articles to get approved. So imagine spending a lot of time doing research while making sure that your finished product isn’t found on other sites, only to be told that what you came up with isn’t good enough. You’re right, $100 isn’t worth the time and effort spent on an article. 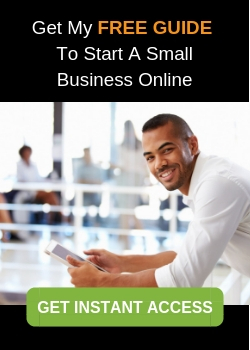 I’m curious about your guide to starting a small business online. Does one need advance computer skills in order to start a business online? Hi Alice, anyone can follow my guide to start a small business online provided they have basic computer skills. However, there’s some learning curve and of course it requires hard work and consistently take action. This method has helped me quit my C-level job and become a full time work at home mom. If you are interested, here’s the link to access my guide.